From ever since I have been able to remember I have always been excited about my birthday. In my thirties I was a tad apprehensive about turning older, but since my fortieth last year I am celebrating being middle aged. My birthday each year brings thoughts of my late-mother, to whom I will be eternally grateful for everything she did and was to me. This day is also another opportunity to remember, celebrate and appreciate her. I wish I had her strength and clarity. I don’t particularly focus on gifts anymore and I am always surprised and overwhelmed by the generosity of my family and friends. I am grateful to everyone who has sent me wishes, cards and gifts, you truly make my day. Thank you for thinking of me. 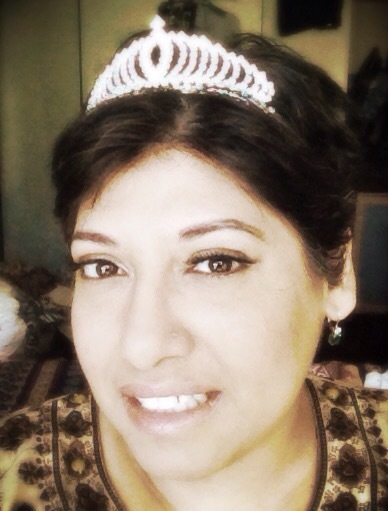 Thank you, I’m very comfortable in my birthday tiara. Happy birthday! 🙂 It’s wonderful to hear form another adult who enjoys celebrating her own birthday. At my last one, my FIL commented, “Aren’t you supposed to stop having birthdays now at your age?” (I’m in my 40s.) I cheerfully told him it would be terrible if I stopped having them and to go enjoy my party. Thank you, it would be absolutely terrible to lose that feeling of magic on your birthday. Happy Birthday. Sweet that you enjoy memories of your mom on this day. Love the tiara. Goes great with the fab haircut too! Thank you, it’s hard not to think of Mum telling me what is was like when I arrived. I think she would have liked the tiara. Wow, Doc, happy birthday–new look looking good! Thank you, make up and photo filters do wonders for a woman. Many happy returns on the day to you! And what a beautiful thing to spend time thinking about on your special day. I would imagine your mother would be very touched and felt greatly loved. Happy birthday dear.All the best.